Senate Republicans are flipping off the President of the United States by refusing to conduct a confirmation hearing for his nominee to the U.S. Supreme Court. By doing this, the majority party in the Senate is saying it doesn’t acknowledge that Barack Obama is the legitimate, twice-elected U.S. President with the right and duty under the U.S. Constitution to nominate justices to fill vacancies on the high court. Just as significantly, by doing this, Republicans are refusing to accept the decision of 65 million Americans who went to the polls in November of 2012 and re-elected Barack Obama as U.S. President. President Obama is the first commander in chief since 1956 to win 51 percent of the vote twice. Republicans are thumbing their noses at those citizens, the majority, who voted for President Obama. The GOP is expressing deep derision for the American democratic process by obstructing the duly elected President of the United States from fulfilling his Constitutional obligations. Before the late Justice Antonin Scalia’s body was cold, truly, less than an hour after his death was announced, Senate Majority Leader Mitch McConnell placed self-serving politics above grace, sympathy and constitutionality. Forsaking public expression of condolence to Scalia’s widow and nine children, McConnell announced instead that Republicans would prevent the sitting President, who at that point still had a year minus three weeks and three days left to serve in office, from naming a replacement for Scalia. That’s because Republicans don’t like the guy the American people used their voice to choose to be the current president. So Republicans want to give the American people another chance to do what Republicans want them to do. Ignoring McConnell’s attempt at power-usurping, President Obama last week nominated Chief Judge for the U.S. Court of Appeals for the D.C. Circuit Merrick B. Garland to fill Scalia’s vacancy. Part of the reason for President Obama’s choice is that he knows some Republicans like Garland. Utah Sen. Orrin Hatch, who sits on the Judiciary Committee, voted to confirm Garland’s appointment to the appeals court in 1997 and said in 2010 that Judge Garland would be a “consensus nominee” to the Supreme Court who would be confirmed with bipartisan support. Earlier this month, Sen. Hatch said that if President Obama wanted a real moderate, he would nominate Judge Garland, but predicted, wrongly as it turns out, that the President wouldn’t do it. Despite Hatch’s prior support for Garland, the Senator has not called on McConnell to schedule the confirmation hearings that are the next step in a normal nomination process. No, like McConnell, Hatch wants to wait to see if he likes the voice of the American people in November better than when they spoke in 2008 and 2012. 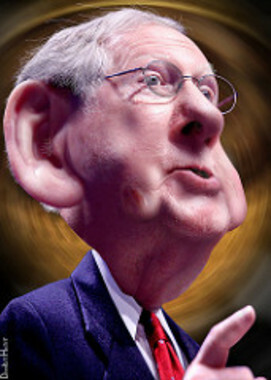 The assertion from McConnell and fellow Republicans that the “American people should have a voice” is doubly duplicitous coming from the party that has spent the past five years trying every trick in the book to deny large swaths of Americans their right to express their voice at the ballot box with all manner of voter-suppression legislation. It is Republicans trying to make students and old people and poor people jump through ridiculous and onerous hoops to exercise their sacred right as citizens to vote. Apparently Republicans don’t want to hear these people’s voices, probably because so many are the voices of Democrats. The truth about this let-the-American-people-have-a-voice gambit slipped out of the mouths of indiscreet Republicans after President Obama nominated the moderate Judge Garland. Hatchand Arizona Sen. Jeff Flake are among the GOPers who revealed that they might hold confirmation hearings for Judge Garland after the Presidential election. Not if a Republican is elected, of course. But if the American people choose Bernie Sanders or Hillary Clinton, either of whom is likely to nominate someone far more liberal than Judge Garland, then the Republicans would immediately go for the moderate Garland. If the GOP Senators did that, they would be ignoring the voice of the American people – people who had just voted for someone more liberal. That would be the voice of the American people that McConnell proclaimed was so very, very important before Justice Scalia’s body was cold. The court McConnell is playing with is crucial to working people. Before Justice Scalia died, for example, there was every expectation that his conservative bloc was going to outlaw fair share fees paid by workers in the public sector who choose not to join their union but who benefit from services provided by collective bargaining. This is a case called Friedrichs v. California Teachers Association. Private sector unions like mine knew that conservative groups would come after us next. Their intent is to starve workers out. If right wingers and their corporate backers can deprive labor organizations of fees for services provided, then workers won’t have the money they need for good research before collective bargaining or good lawyers to represent them in grievances against employers. Then big corporations win every time. And workers fall further and further behind. Now, however, Friedrichs will likely end in a 4-4 stalemate, reverting back to the lower court ruling, where the conservatives eagerly agreed to lose in their excessive hurry to get their appeal before their sure-bet Scalia. In the end, they outsmarted themselves. In fact, the Senate has confirmed six Supreme Court justices in election years since 1912. In the most recent case, when Republican President Ronald Reagan nominated Anthony Kennedy, a majority Democrat Senate confirmed him, unanimously, in the Presidential election year of 1988. Antonin Scalia prided himself in being a strict Constitutionalist. If McConnell wants to stop the late justice from spinning in his grave, then the majority leader needs to order the Senate to perform its Constitutionally-mandated job by conducting a confirmation hearing for Judge Garland followed by a vote on his nomination to the Supreme Court.